five + = 14 Required Please enter the correct value. This U.S. oil rig count chart shows the massive impact falling oil prices have had on oil drillers. Baker Hughes Inc. (NYSE: BHI) reported today (Thursday) that the number of oil rigs in the United States dropped to 802 last week. It was the 17th straight week of declines as 11 rigs shuttered operations. 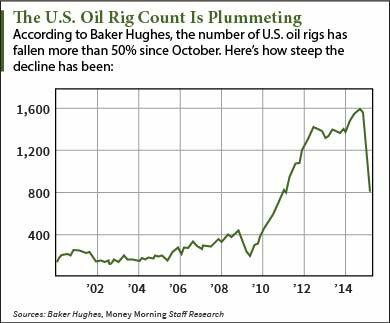 The number of rigs in the United States has now fallen more than 50% since October. That's when the industry hit a high of 1,609 rigs. Last week's rig count was the industry's lowest total since 2011. The Permian Basin in Texas and the Williston Basin in North Dakota have been two of the hardest-hit regions. Rigs in the Permian have fallen from 560 in November to 283 last week. Williston has seen its rig count fall from 200 in November to 97. Baker Hughes officials said in a January earnings report that the total oil rig count has fallen between 40% and 60% during previous downturns. "We think 1,000-1,200 rigs will keep production steady. With 800 rigs, we should see production decline in the second half of the year," Bank of America's Francisco Blanch told Reuters. "We might see a little more rigs lost, but the majority of the fall is behind us." Oil prices have now fallen more than 51% from June highs. WTI crude oil futures dipped as much as 4% Thursday to an intra-day low of $48.11. So far, production levels have not been affected – even though rig count has fallen by about 50%. In fact, production rates are still rising. The EIA now estimates that crude production in the U.S. will approach 9.5 million barrels a day by May. That's up from roughly 9 million a day in November. So why is production up with rig count down? "Thanks to the shale oil boom, we now have significant extractable oil reserves in North America (especially in the United States) that can rapidly be brought on line to meet any demand surge, along with a historically high volume of oil in storage," says Money Morning's Global Energy Strategist Dr. Kent Moors. But that production growth won't last forever says Moors. He says that most of the production is coming from new rigs that were built in the last two years. They can support lower prices more easily than older rigs, but not for long. "Between July and September of this year, production will finally start to decline from the wells that were recently put on line," Moors said. That will spark an oil price recovery in 2015. Here's how high he sees prices climbing, and the best way to start profiting from the rebound.